This is my demo painting from a recent watercolor class on painting waterlilies. The students learned how to create glowing lily flowers, how to paint their reflections in the water, saving whites, beautiful greens for lily pads, and layering of washes to enhance the scene. 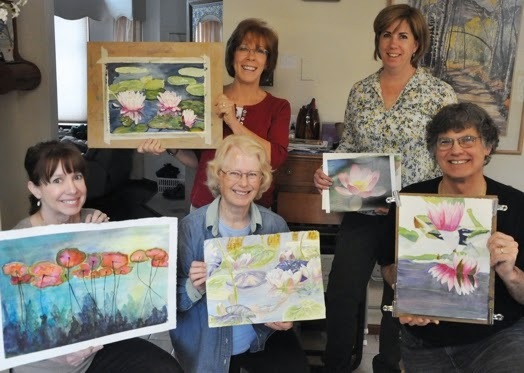 Below is an image with the students and some of their waterlily paintings. We really enjoyed getting to know each other and further our knowledge of watercolor. My new summer class listings will be out soon. The classes will include a Beginning watercolor class and several 2 and 3 day workshops for beginning to advanced students, from June to August. If you would like to be added to my newsletter email list, so that I can notify you of future classes, please find the Newsletter Subscription on the upper right of my homepage, fill in your email and click submit. A leur sourire, il est indéniable que ces charmantes personnes soient satisfaites de leur cours. Une très belle oeuvre que ces nénuphars. Salut, Je vous remercie. Nous avons eu un temps merveilleux dans cette classe de nénuphar. Lori, I've always liked your water lily paintings, and your colors are always so fresh. I could certainly learn a thing or two from you! Thanks Johanna. We had a good time in the waterlily class.